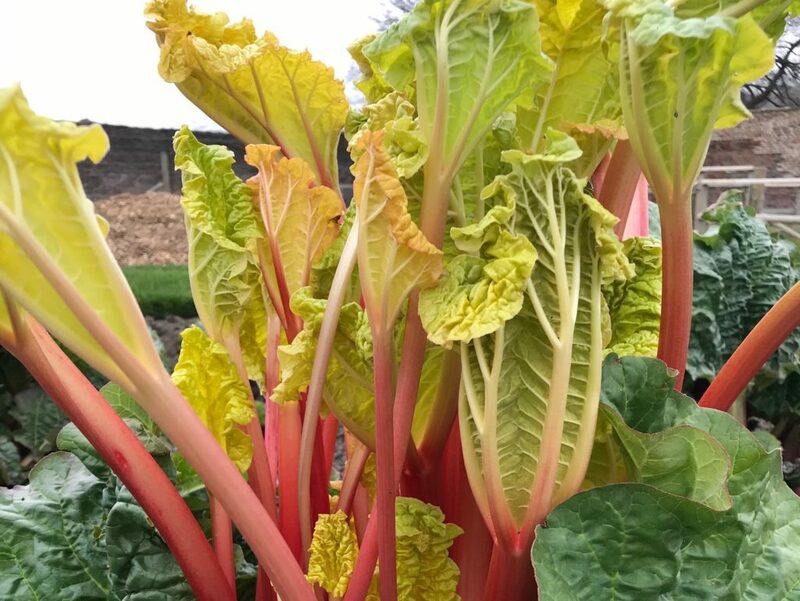 Maria Mahon, kitchen gardener in Harewood’s Walled Garden gives an insight into this easy to grow and long lasting crop – rhubarb. It’s that time of year when rhubarb is starting to grow and those delicious crimson stems can be seen gradually emerging from the soil, stretching and unfurling their young green leaves as if waking up from a long winter sleep. Allotment holders and vegetable gardeners alike will be looking forward to all the scrumptious culinary ways in which to use this famous Yorkshire delicacy. During the Victorian era and right through to the end of the 2nd World War, rhubarb became very popular as growers discovered how to achieve an early crop of deep pink, tender stems through a technique known as forcing. Forcing involves tricking the plants into thinking spring has arrived. Planting them in dark heated sheds during the winter months, the plant searches for light and as it does so, the stems become thinner and less fibrous than those grown out in the field. Growers in Yorkshire led the way when it came to growing rhubarb, and most folk have heard of the Rhubarb Triangle (Leeds, Bradford and Wakefield). However, during the 1950s demand for rhubarb went into decline as more exotic fruits became readily available from overseas. So, how easy is it to grow rhubarb? Very easy is the answer. Rhubarb requires very little maintenance other than an application of a general purpose fertiliser around the crowns once the harvesting season is over and an annual dressing with well-rotted compost or manure in January or February. It needs a sunny spot with well-drained soil and so long as it is kept well watered, will provide delicious stalks ready for harvesting every 6-8 weeks during spring and summer, depending on the variety. The easiest way to introduce rhubarb is to plant crowns and we were very generously donated some crowns from RV Rogers nursery at Pickering. Whilst November is the ideal time to plant crowns, they can still be planted right up until early spring if the ground isn‘t frozen. Rhubarb is a vegetable rather than a fruit and a lot of people mistakenly think that the colour of the stalk indicates its ripeness. In fact, it is quite the contrary, the more time the stalk spends growing before it is picked, the tougher and more fibrous the stalk gets as it photosynthesises, so it is good to pick the stalks regularly. We’ve a good crop on display now in the Walled Garden and hope to see some fine samples on the Courtyard Café menu in the next week or so, any perhaps for sale in the Courtyard shop. Posted 11 April 2019 at 1.08pm by Lindsey Porter. Filed under: Notes, Walled Garden. Britain had only 3 weeks’ worth of food supply left when the Women’s Land Army, a voluntary group, was formed in 1915 and it was to be a time that changed the role of women for good. The shift that took place 100 years ago will directly have influenced the fact that there are three full-time female gardeners in the Walled Garden today, and a team of wonderful and willing female garden volunteers. As part of the Cultivation of Lands Order Act in 1917, which ordered farmers and land owners to plough up pastures and convert them into arable land to grow crops such as wheat, barley and potatoes, women were recruited in paid roles to take the place of men, who were fighting in their millions on the front line. By 1917 over 260,000 women were employed as labourers and farm hands. Just prior to the war, the Allotments Act was passed, with the aim of helping households on low incomes, living in the towns and cities, to supplement their food supply by growing their own fruit and vegetables. 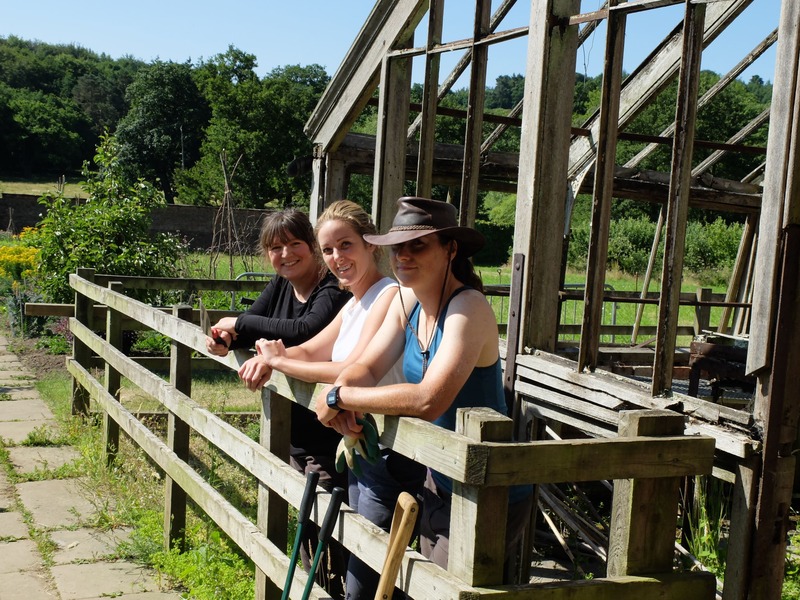 Harewood’s Walled Garden might have been a ‘model allotment’, showcasing to the many city-dwelling women how to make a success of their food growing. Experienced horticulturists in large gardens like Harewood were often on hand to demonstrate and the focus was very much on growing crops that were highly nutritious, calorific and relatively easy to grow. 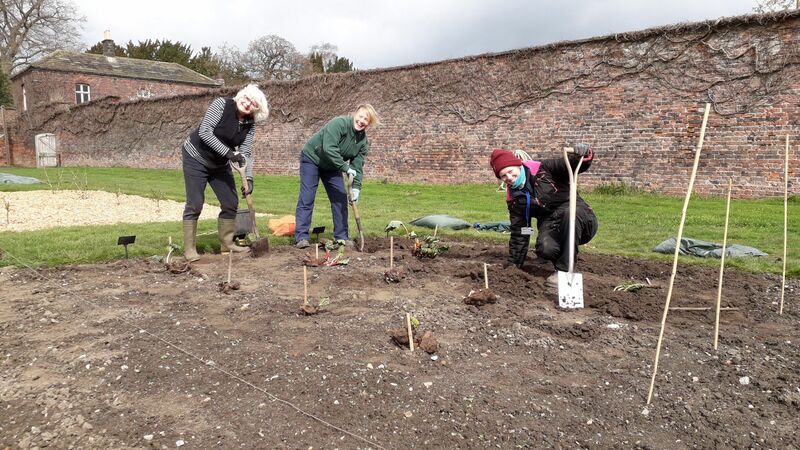 We’ve recreated elements of a model allotment in the Walled Garden as part of Seeds of Hope. Legumes (peas and beans) would have been an important part of the garden and remain so today, as they are incredibly versatile, being nutritious, tasty, easy to grow, and able to be eaten in many different forms; from freshly picked from the garden to dried and stored for later use in soups and stews during the winter. In the right conditions (a wind free, sunny spot with soil rich in organic matter); sowing every two weeks; picking at least twice a week and the careful choice of early, main and late cropping varieties – growers could achieve a constant supply during the months of June to October. Peas provide an excellent source of vitamin C – known to help increase our resistance to infection and aid the absorption of iron from leafy green vegetables. Beans provide a source of dietary fibre, necessary for keeping the digestive system in good working order. Here in the Walled Garden we have been growing an interesting selection of some of the heritage varieties, one or two of which have some very unusual names indeed, such as ‘Nun’s Belly Button’ and ‘Lazy Housewife’! We’ve enjoyed our exploration and discovery of peas and beans. The pea can be dried and preserved, but the bean is more versatile and a far superior crop. We have grown over a dozen heritage varieties of broad beans, French and runner beans this year, all of which we think would have probably been grown in allotments up and down the country during the First World War. In terms of order, Broad beans would have been the first in the season to grace Britain’s dinner tables, with an early crop in June, French beans would follow, harvested as young pods, these are delicious simply topped and tailed and boiled briefly within an hour of being picked. 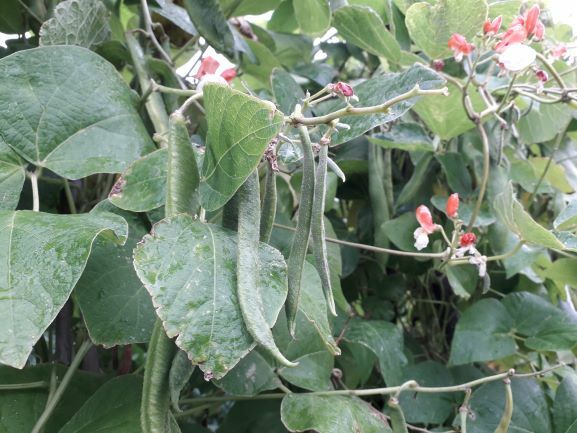 We have been growing ‘Blue Lake White Seeded’ a heritage climbing variety of French bean which is early maturing and produces string-less pods. It is a very decorative variety with beautiful white and yellow flowers. We started this off in the greenhouse back in May and planted out in early June once any risk of frost had gone. Another sowing was also done 3-4 weeks later, and we have been picking beans none stop for the last 2-3 months. Probably Britain’s most favourite bean however, is the runner bean and the heritage varieties we have been growing are ‘Painted Lady‘ and ‘Scarlett Emperor’, both of which are still widely grown today, mainly due to their decorative nature. Also known as ‘Yorkshire and Lancashire’ and ‘Scarlet Runner’ due to its red and white bi-colour flowers, it is one of the oldest varieties of vegetable still available. To show just how valuable and versatile a crop peas and beans are, here are some links to some of our favourite recipes, using them at various stages of maturity. Posted 1 October 2018 at 1.44pm by Lindsey Porter. Filed under: Notes, Walled Garden. Walk around the walled garden today and you’ll see some wonderful examples of heritage kale growing in our vegetable beds. Check out the glorious display of contrasting colours and textures, ranging from the slender, dark green blistered leaves of ‘Nero di Toscana (1792)’, a variety which reaches over 5ft tall and is sometimes referred to as ‘Black Kale’; to the voluptuous, mid-green, densely curled leaves of the ‘Dwarf Green Curled (1779)’ which, as the name suggests, is a shorter variety reaching just 2ft high. 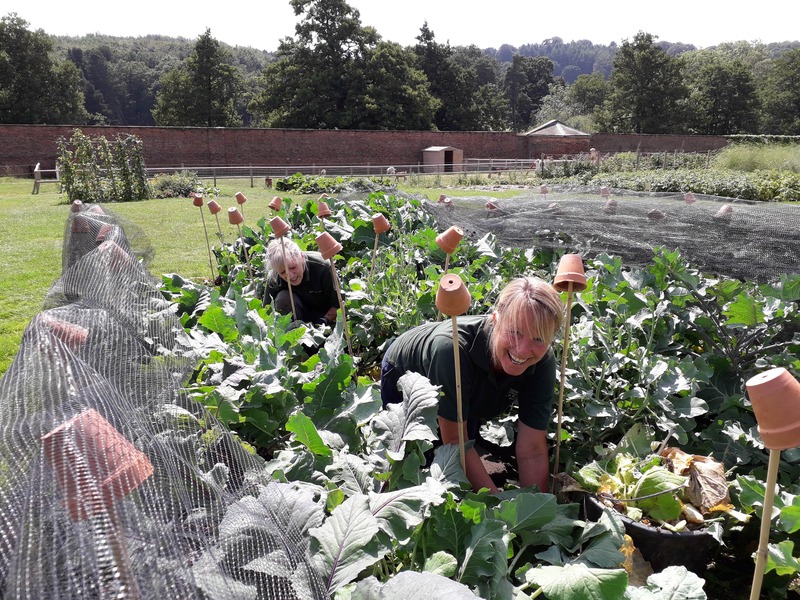 As part of Seeds of Hope, reimagining the Walled Garden 100 years ago, we have brought the kale on early so visitors can see, hear and read about all this super food. Kale would have been a dominant feature in the Brassica beds of 1918. It has many virtues and fits with the pressing need at that time for reliable, prolific and nutritious crops. It has gained momentum as a super food over the past few years, one reason being that it contains six times more calcium and seven times more vitamin A than an average portion of broccoli. 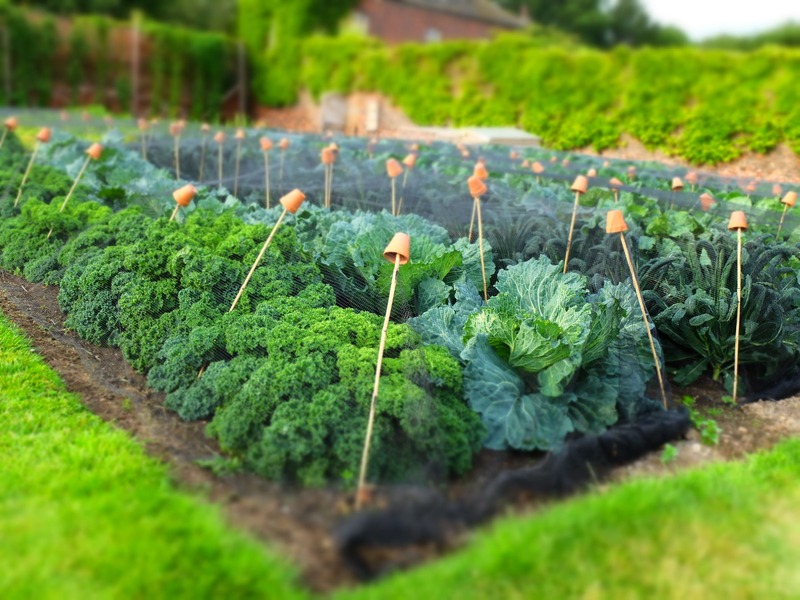 Gardeners would have found it easy to cultivate, as it tolerates relatively poor soils and doesn’t suffer quite so much from all the usual pests and diseases which can ruin a crop of many of the others in the Brassica family. And it is generally a very hardy plant, with many varieties able to withstand a hard winter frost. Indeed, kale contains its own ‘anti-freeze’, which actually makes the leaves taste much sweeter after a frost; Brussel sprouts share this quality too. Whilst cultivating this latest version in the Walled Garden, it has become clear that our much-loved green vegetable can be grown practically all-year-round, which would have made it ideal during the wartime. Its cut-and-come-again ability is just another boost to its super power crop and by picking a few leaves from the bottom of each plant, from several plants at a time, it can provide a constant supply of fresh greens for the dinner table for many months. New leaves from the top of the plant just keep growing, leaving a large, thick green stem at the end of its productive life. Depending on the variety and the harvesting, one kale plant can last anything from 3-6 months, making it a wartime staple. Steamed, fried, softened in butter, there are some wonderfully inventive and tasty kale recipes, some of our favourite links are below. The kale will continue to look good in the garden for the next few months as we continue to cultivate and plant. Posted 28 August 2018 at 4.05pm by Lindsey Porter. Filed under: Behind the Scenes, Walled Garden. As part of the Seeds of Hope exhibition in the Walled Garden we have been growing an interesting selection of heritage fruits and vegetables that we researched and believe may have been grown here during the First World War. Old seed catalogues and articles published in the 1918 Gardeners’ Chronicle, a monthly magazine for Head Gardeners, enabled us to develop planting plans and resources from a few of the specialist seed suppliers still growing these old varieties today, such as Thomas Etty, Garden Organic and Pernnard Plants. In 1914 Britain imported over 60% of its total food supply. British farmers focused on the production of livestock for meat and dairy, a far more profitable and much less labour-intensive product than arable crops. As the war progressed, the Government became so concerned that Britain may run out of food, in part due to the sustained bombing campaign, that they decided to take action and in February 1917 introduced rationing for the first time and launched a ‘Ploughing Up’ campaign. This ordered farmers to convert pastures into arable fields to produce vital crops such as wheat, oats and potatoes. In November 1917 the Harewood Estate received its order and the 5th Countess of Harewood actively encouraged her own tenant farmers, gardeners and other local farmers to employ women on the land. Over the next few months, we will share with you just some of the examples of what we believe would have been grown in the Walled Garden to provide food for the Harewood Estate’s staff, the soldiers convalescing in the auxiliary hospital in the house as well as for sale in the in the local village shops and markets. With our Kale looking particularly vibrant in the garden this month, the first blog will highlight its virtues and varieties. Read more about Seeds of Hope. Posted 21 August 2018 at 11.00am by Lindsey Porter. Filed under: Notes, Walled Garden.